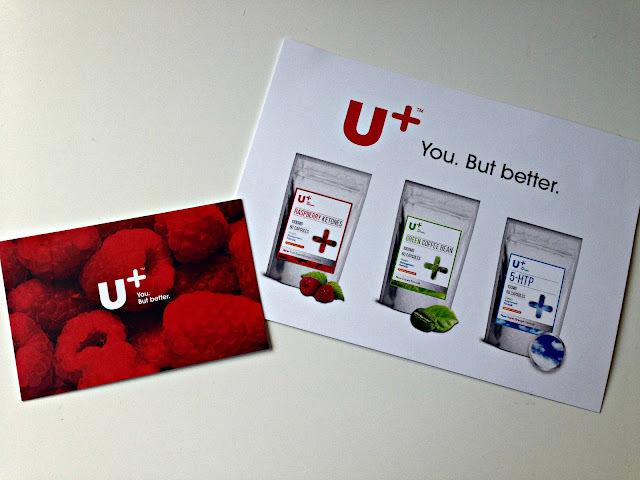 Sticking a little with the health theme from my last review of the Hairworx hair vitamin capsules, the next product I've been trialing is the U+ Raspberry Ketones. I'm sure most of you have heard of these ketones before, I remember there being a big amazement about them and the big dash to get to Holland and Barratt as they had two for one on all their raspberry ketone capsules before they all sold out- and trust me, they did! It was the must-have craze at the time but after a few weeks everyone had packed them in! I myself actually enjoyed taking them and did notice a difference to my weight loss but after finishing my pack I never bothered to re-purchase. Whoops! 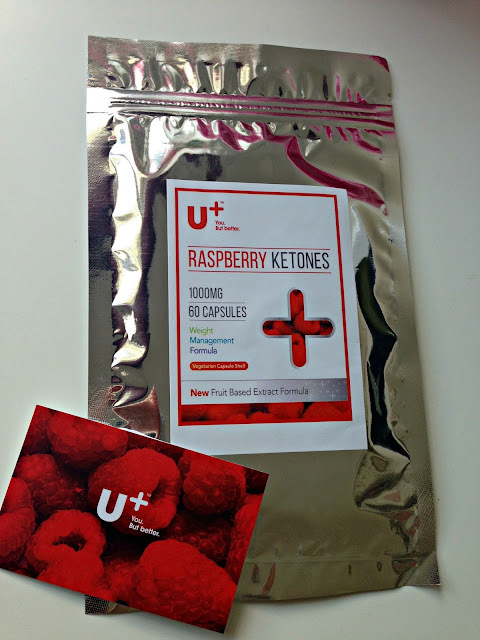 Well last month U+ were looking for volunteers to try out their own brand of raspberry ketone capsules and I thought I would give them a second chance and volunteer myself! If you've never heard of U+ You. But Better, they provide high-quality weight loss supplements in the form of raspberry ketones, green coffee bean and 5-HTP capsules. They boast themselves as a forward thinking and fast moving supplements brand who bring the finest ingredients and formula's into all of their products. Surely they can't be too bad, right? After ordering the capsules from Amazon, it was only a few days after when they arrived at my door. I really loved the packaging as soon as I saw it, just a very simple and modern foil pouch! As soon as you open the pouch, the smell of raspberries hit you. Yum! The capsules size itself is the same as the Holland and Barrett tablets which I had problems with last time - I know I'm a wuss! As I said above I have used Raspberry Ketones in the past and apart from having problems swallowing the damn things, I had really good results. As well as dieting and working out regularly, I had lost well over a stone in less than a month. Not bad! Since I had such good results I was hoping for the same from the U+ capsules. I've been taking these capsules for about a month now and although I haven't been as strict as I would have liked with my diet or the gym, my weight is slowly but surely going down! Since starting them I had a few things going on in my personal life which might the reason for loss as I've hardly been eating but over all I've lost 10 pounds! 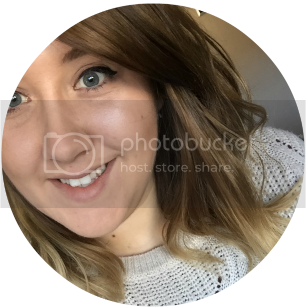 After my month's trial I'm really pleased with the results and I definitely think I'll be sticking with them! If you fancy giving them a go for yourself, you can check the capsules out on U+'s own website or on their Amazon page! I have tried green caffeine before and got a little bit of a difference but doubted that the raspberry ketone did anything! I think of a ketone when I hear of them (and dang, I don't want to be ingesting those!) but I am so tempted to give them a try! These sound so great, I've tried raspberry ketones before but I never monitored my weight to see if they actually made a difference!